I came across a Walt Disney organisational chart in this video about UX Design. The speaker mentioned how the UX designer should work more like the director. 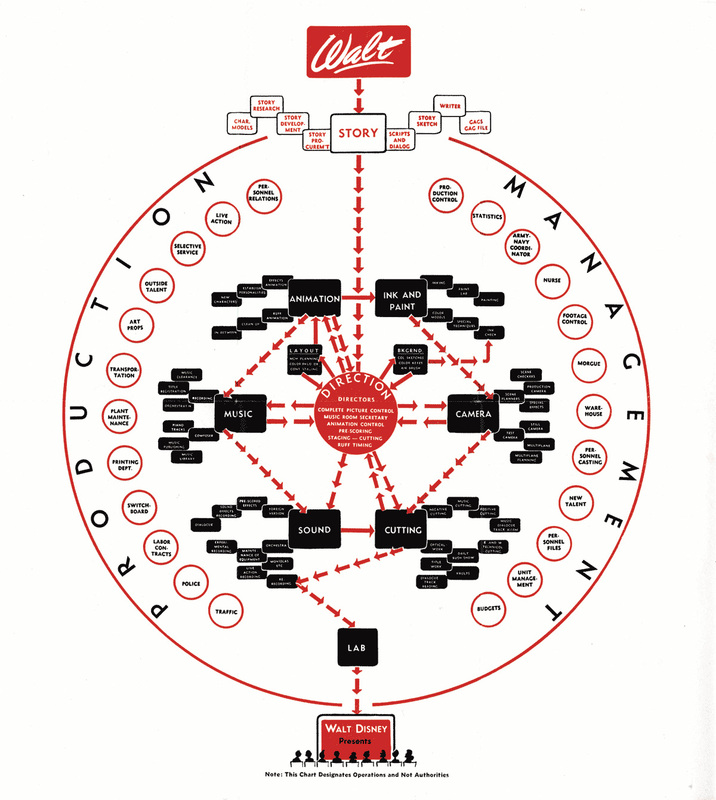 Walt Disney’s organisational structure is all focused on output. From the story to the final release, everyone is working towards a common goal. He suggested that UX should follow suit. I think this is a good example to think about and it suggests the designers have to lead the organisations to ensure great experiences get out into the world. He mentions designers must not let others define their jobs. I think it’s a great comparison as after all, what Disney do realise is a pure experience which will be critiqued. Another point I think that is useful, is how this organisational chart and the example could inspire us. Perhaps we can look at other organisational charts. Perhaps we can also look at how directors work to see the future of how designers could and should work. This is interesting and also reminds me of the project I’m helping out on at Creation Center. As you know, I’m working on a app which will be released early next year. This project is completely controlled by Creation Center except for finance. The guy who is running the project called Andreas told us that a traditional route for an idea that gets out of Creation Center is that once its outside, it is completely handed over to the mangers. When they are in control, they face many other pressures and the original idea becomes diluted. And because of this, Andreas decided to release their own product so that the original idea is not lost in the Telekom process. So there is definitely that need and it is probably happening in other organisations too. But it is hard to see a consultant being able to take this approach due to its inaccessibility to finance.